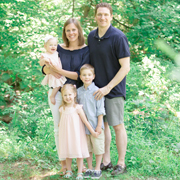 By now you know we were not graced with the warm and sunny August wedding day that we had envisioned. (Though it’s supposed to be absolutely perfect weather for our first anniversary tomorrow!) This caused several changes in our wedding day plans. Guests gripped umbrellas during the ceremony. The cocktail hour was moved from the pool house to the tent. We had limited time for outdoor photos. 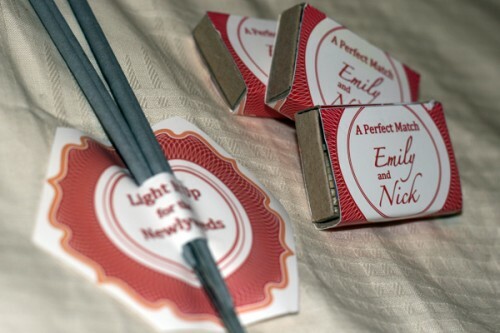 And we were not able to use sparklers for our grand exit as Mr. and Mrs.
Nick and I spent hours assembling matchboxes and sparklers based on templates from Twig & Thistle. They were neatly displayed for guests to pick up at the end of the night and wave as we exited the tent and walked along a path of candles suspended from shepherds hooks. By 10pm we knew this was not going to happen. 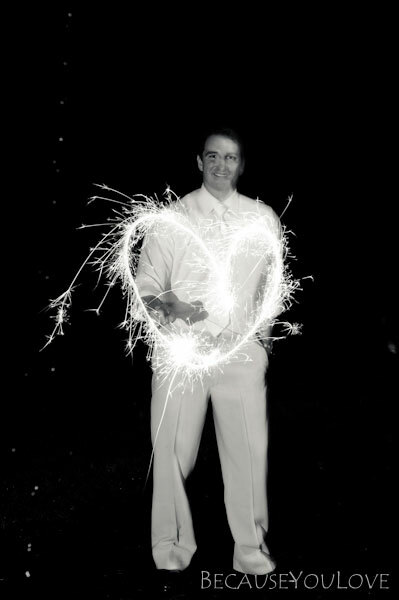 While I was on the dance floor with my bridesmaids, my dear husband and devoted photographer wandered into the rain to get just one sparkler shot for me. That is love.